Our previous two posts on this subject were critical of ISO [1, 2]. We did, however, try to emphasise that head changes led to ISO getting captured by Microsoft. Essentially, Microsoft destroyed ISO from the inside over the past year or so (there are similar examples). Those who fought against it seem to have left and those who remained or were appointed (e.g. the Microsoft-friendly Alex Brown [1, 2, 3, 4, 5, 6, 7, 8, 9, 10, 11, 12, 13, 14, 15, 16, 17, 18, 19, 20, 21]) turned ISO into a ‘Microsoft shop’. 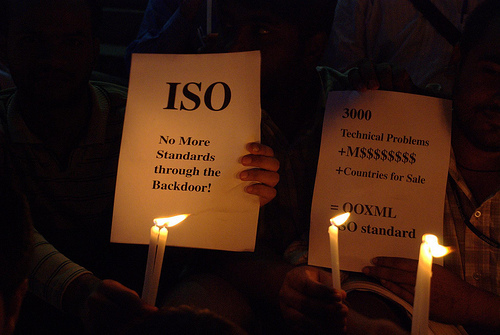 Can the world rescue ISO from Microsoft and attempt to restore order to international standards? Or is the damage done irreparable? Confidence has already been shattered. Some believe it may be possible to change this, at least by elucidating the situation and its severity. ISO members failed to disapprove the Open XML format. Microsoft has compromised the International Standards Organisation (ISO) during the rush to get a stamp for their Office OpenXML (OOXML), using unfair practices such as committee stuffing in several countries and political interventions of ministers in the standardization process. “Who wants this,” asks Pieter Hintjens. Well, surely not the people of Brazil, one of the world’s largest populations. From Brazil comes another response and background story about the latest formal complaint (with possible action to ensue). Thus, managers of the major IT governmental organizations in Brazil, Venezuela and South Africa wrote and co-signed an open letter to ISO, to express their dissatisfaction with the final result of this all. The letter was also signed by managers of similar entities in Ecuador, Paraguay and Cuba, in a clear signal that this affected more people than I imagined. This news has also just reached IDG. The OOXML fast-track process and subsequent approval vote in the ISO was riddled with complaints that Microsoft acted unscrupulously, the standards process was not implemented properly and the specification approved was too unwieldy to implement. As a result, the national bodies of Brazil, India, South Africa and Venezuela filed protests. The world tried to vote properly. Failing that, given the sheer abuse, complaints began to arrive. But perhaps it’s time to give ISO another chance to clean up its act, or else it might go the way of the dodo, in due time. This would serve Microsoft ever better. ISO’s reputation has been injured for over a year, based on internal ISO correspondence. The longer it goes on for, the worse it will get. Why is ISO doing this to itself? An admission of failure is damaging indeed, but not quite as damaging as outrageous denials and damage control. Simular letters has been circulating in Denmark as an e-mail from the Danish MD Jørgen Bardenfleth to customers and business partners.